GKN Aerospace is a world-leading manufacturer of aerospace Engines and components. GKN Aerospace is a world-leading manufacturer of aerospace engines and components. This project involved the construction of a building at their Cowes site to house an exciting joint venture with RollsRoyce. Armashield were approached about the need for internal speed doors and the external loading bay roller door. On this project we worked closely with the main contractor Geoffrey Osborne and the design team in order to deliver the project to GKN’s demanding requirements. The project involved several controlled clean room areas requiring high speed doors. GKN’s specifications included specific requirements for the doors such as air permeability of less than 12m3/h/m2 at 50 Pa and the ability to perform correctly when subjected to positive pressures from within the clean room. 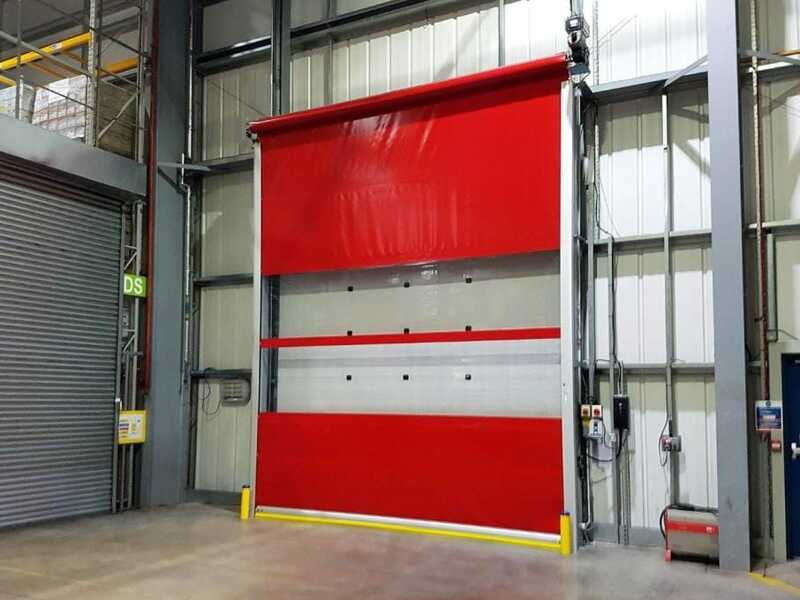 The project also involved some large 5m x 5m speed doors and all speed doors were required to have a soft bottom edge for safety and maintenance reasons. In addition a door was required to offer security and insulation for the external loading bay and a further fire protection barrier was needed behind this. The project was completed on time, ready for the long and complicated fit-out by GKN. The Rapidor speed doors offer opening speeds up to 2500mm per second, which combined with radar movement sensors facilitates efficient traffic flows around the building. The doors finished in Ultramarine Blue with transparent vision windows also fit in well with the clean and efficient image of the new production facility. The self-repairing zipper and soft-edge system also helps to reduce ongoing maintenance and repair costs. Most importantly the doors excellent air tightness ensures compliance with GKN’s rigorous hygiene standards and helps to facilitate the successful manufacture of their world-leading products.